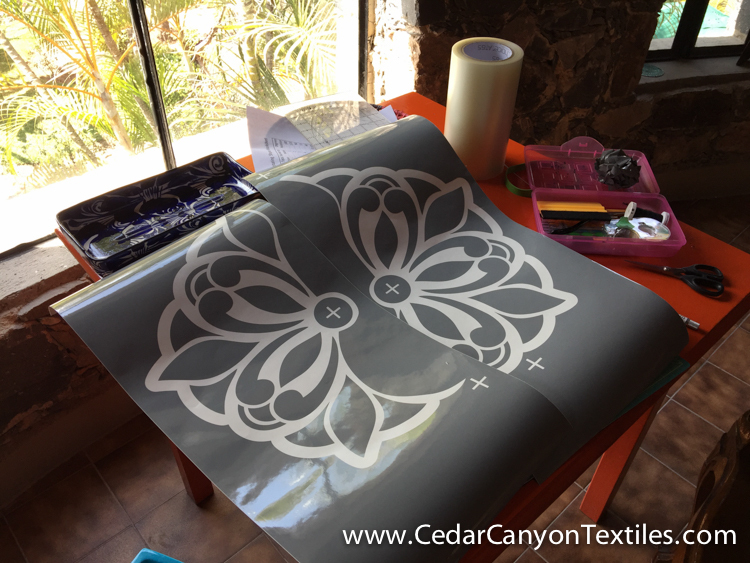 When I returned from Chapala a year ago, I wrote a post about my Studio Essentials. 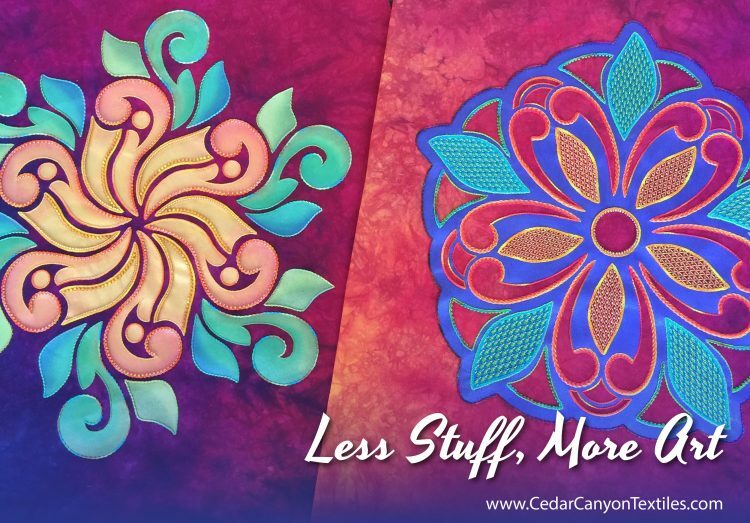 Having just completed six months with exactly those supplies and nothing more, I can tell you that “Less Stuff More Art” really works! 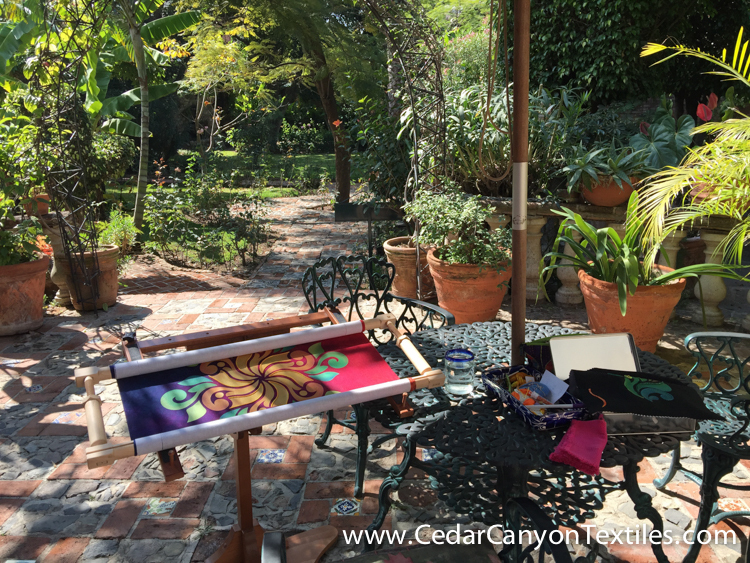 I spent the season in Chapala with a Silhouette machine, a small selection of fabric, a set of Paintstiks, a bunch of beautiful embroidery threads and a small collection of beads. 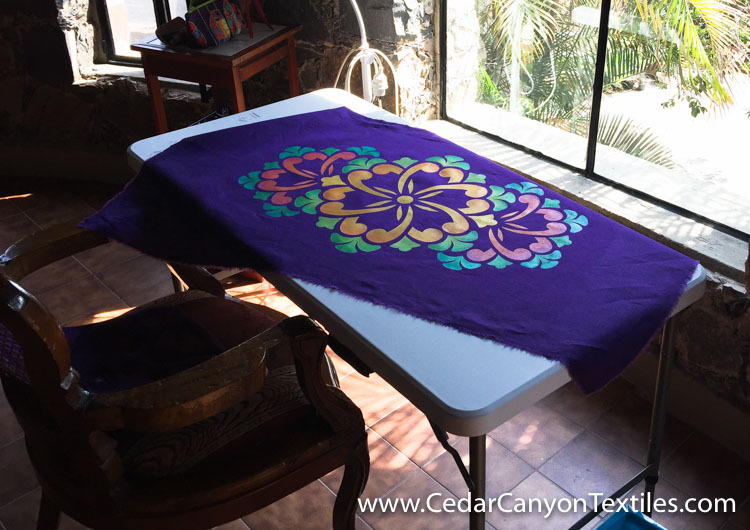 I missed having a sewing machine in the worst way, but my lack of “stuff” kept me focused – and I completed more art in six months than I had in the past two years! I have not yet sent a shipment of furniture to the house in Chapala. My studio there is basically bare save for a couple of tables, one chair, and a wardrobe that I use to store my small collection of art supplies. In the top of the wardrobe, I have samples, completed work and fabric on hangers. I also use this space to store my bins of perle cotton and anything tall or oddly shaped. There are three modest size drawers in the base of the wardrobe. One is for Paintstiks, brushes and related supplies. 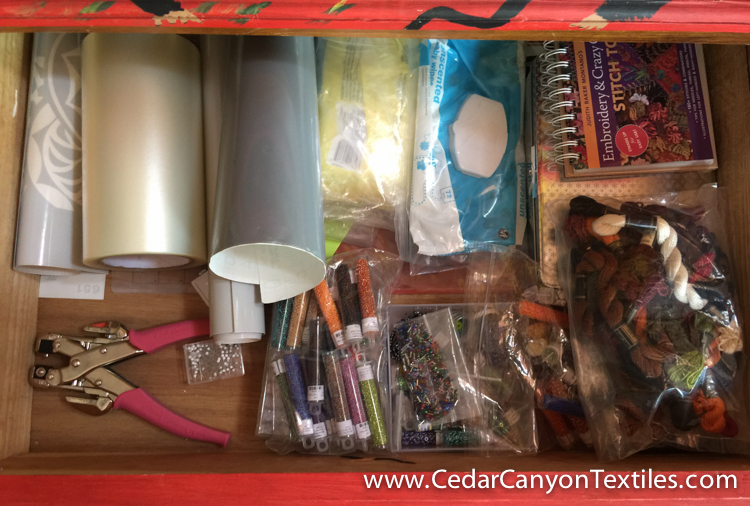 The second drawer contains Silhouette supplies, beads, and some additional threads. 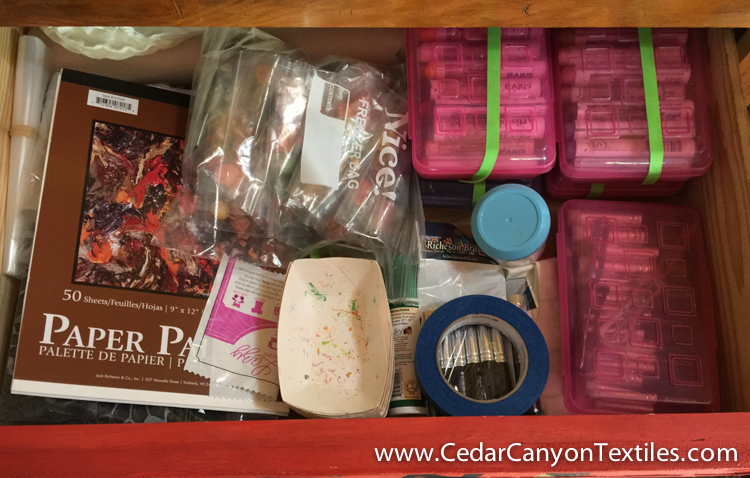 The bottom drawer is for fabric and sewing related supplies. 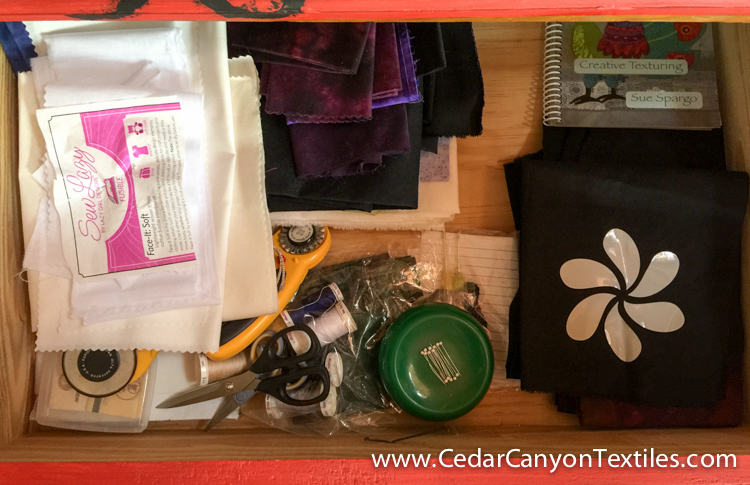 I tried storing more fabric here, but it was too heavy and the drawer dropped off its runners. Oops! When I wrote that post a year ago, I “believed” that having less stuff would be better. I “believed” that I could live (happily) without all the stuff packed into my studio in Minnesota. I “believed” I would actually make more art by removing all the distractions that kept tugging on my conscience and setting my Should Monster off into overdrive. Well, it worked. For me, it really worked! Here’s a peek at a few things I learned. I made only one purchase for the studio. It’s a simple folding table about four feet wide that works well for painting as long as I’m sitting down. I learned that the morning is the best time for painting. It gets a bit bright when the afternoon sun streams in this window! For stitching, I chose my location based on the weather. I worked on the front patio a lot when the weather was cooler, and retreated indoors for shade as it got warmer. 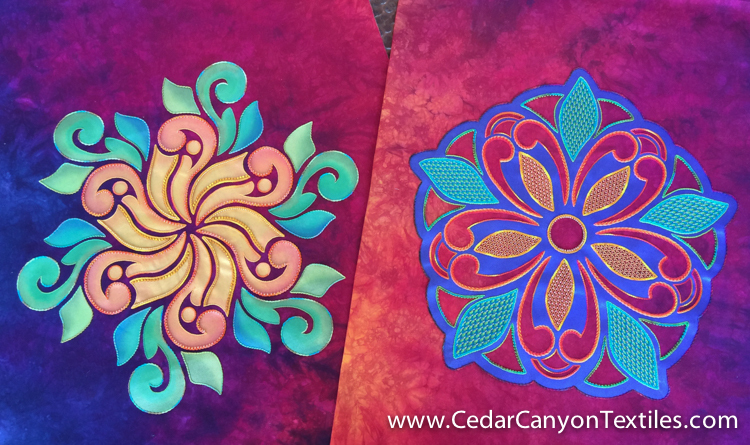 StarFlower 1 and StarFlower 2 ready for framing! … and I painted one for the road so I have something to stitch on this summer. Now that I’ve proved that Less Stuff More Art actually works, the trick is to keep it going. I’ll be shipping some furniture and supplies to Chapala this summer and I’m going to have to make a lot of tough choices. Yes, the sewing machines come with me. To say that I missed my machines would be the understatement of the year. As for the rest of the stuff from the studio? Not so much. It’s hard to part with things I once loved. It’s hard to admit that I’m never going to use a bunch of the things I purchased over the years. And yes, it feels wasteful and I feel guilty. I’m no different than anyone else. But having experienced the freedom that comes with a carefully curated set of supplies, I’m all in. It’s fun, it’s exciting and completely liberating to part ways with all the Stuff that drags my attention away from my happy place. So what are you thinking? Do you love having tons and tons of options? Do better when you are more focused? I’d love to hear your thoughts. Congrats!! I believe you’re right!! I have purged a lot since I retired. I’m currently trying to use up a lot of my fabric stash. All the stuff gathered in decades past begs to be used but the reality is we have changed. Yes, we spent a lot of money gathering but there is no shame in sending it back into the world where someone will pick it up and put it to good use. Our creative spirit needs to get the ‘stuff’ out of the way! Onward, Best of luck and much joy to you in your final purge and move. Thanks, Bev. I love your thought about sending the stuff to someone who will put it to good use. That’s far better than letting it gather (more) dust — or stuffing it in a box and shipping it to Mexico! Shelly, it’s good to know you’re alive and well and working like a fiend! I was surprised last fall when you still hadn’t sold your house, so I’m happy for you that you sold it right out of the box this spring. Although after only about five years in your dream home, I can’t believe you didn’t stick around longer. Funny about getting older. I have enough “stuff” to stock several stores of one kind or another. My main deal is sewing. I’ve been doing that since I was 5, and there never seems to be enough time to actually do all the things that are brewing in my head. In addition, I’ve been learning the things I’ve missed along the way. And I’ve been taking jewelry classes, as in metalsmithing, which is very time consuming, I knit and crochet as well as other things. I find that each of the things I do adds to the others. You’d think retirement would give you more time. Not so. There are just too many things to do. Anyhoo, I empathize with you about cleaning out your stash. I’m working on that, too, but it’s going very slowly. I have time to clean things out, which also means I have time to think too long about keeping, giving, or tossing. I am finding that your philosophy of doing with less frees you to focus more on what you’re actually doing now, rather than thinking about all the things you want to do later. One day at a time. I’m happy that you found a place that suits you and Jack, where you can take advantage of your surroundings and do all those art projects you’ve been wanting to do. I do hope, though, that you will still return to Minnesota once in a while to teach and to visit the area you once called home! It’s always lovely to hear from you, Barb. Minnesota has not seen the last of me. I have a sister here in the Twin Cities and lots of ties to the quilting community here. When folks ask if I’m going to stay in Chapala “forever,” I just chuckle. In my mind, nothing is Forever. It’s just where I see myself for the immediate future. Your pieces are stunning. Your embroidery is spectacular! I am always impressed with what you do. Do you use a hoop for your embroidery? Does it mar the paint? The painted church banner is all done being painted and it was mighty tedious to quilt around every detail. It is being blocked now and then I will bind it. I will send a pic when everything is done. Thank you, Rebecca. I’m very happy with the pieces. They have not been stretched and framed just yet. I wanted to bring them back with me this summer, and it was much easier to roll them up than to transport them after they are framed. I don’t use a hoop. I use an embroidery frame and a floor stand. I wish I loved the company that makes the frames as well as I like the frames. Be sure to read my update at the end of that post before you get excited and send off an order. don’t think I’m quite ready to purge but I have challenged myself to make with supplies on hand…Resist buying anything new. It is fun to go into the “Studio” and make something without going to the store. Use the hook n eye from the card that says “Price .35” that was in my Mom’s stash. I love hearing about your adventures. Thanks Mary. We’re all at different places in our creative journey. I’m quite sure I would not be so gung-ho about purging if I were not making a major move. Your “make it with the stuff you already have” plan is a great one. When you take away the option to go to the store, your Art Brain has to figure it out! As I have aged (I”m 70 now) I have found that I don’t need enough “stuff”. It seems that I am constantly bagging up things to go to the local thrift stores. And yet there is always more. Did I really move from a 2 bedroom apartment to a 3 bedroom house with all of this stuff? The one exception has been fabric. I think I may be addicted. Seems like I am always buying more. At this point I doubt I can ever use it all. Maybe I need to follow your example. I hear you, Susan. I swear that fabric is more addictive than chocolate! But here’s the deal. The path I’m taking may not be right for you. It’s for you to figure out your own list of Studio Essentials — your own list of the things that really make you happy. And, by the way, it’s perfectly okay to be a “dabbler” if that’s what makes you happy! You don’t have to be a Serious Artist. You don’t have to whittle your stash down to fit in a certain number of bins or boxes. But when you find yourself distracted and overwhelmed instead of happily making art, give yourself permission to clean house. It’s not a lot of fun in the middle, but it sure feels good when it’s done! 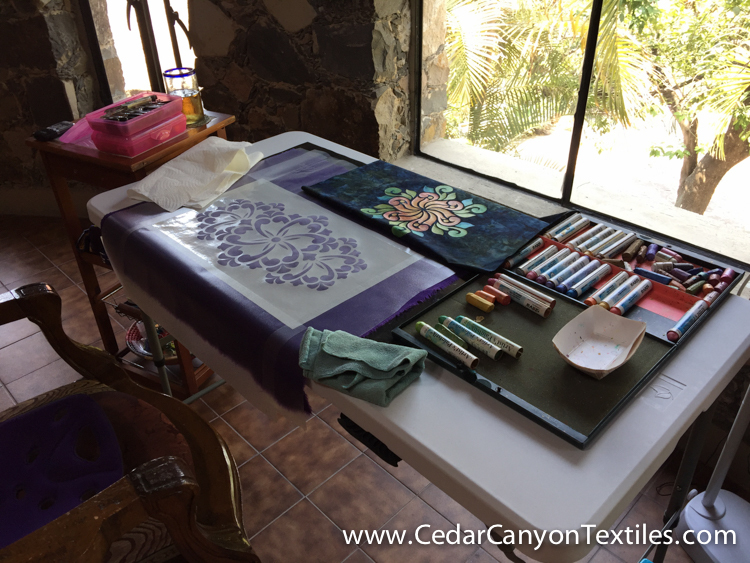 Tatting, sewing, bobbin lace making, painting, jewelry. In my old house I had an empty bedroom for each and now they are all together in one large room! I need to get serious about “moving on” the things I won’t use anymore, so that I can have space to play. But it was all a part of me at one time and how do you get rid of ME? That’s what makes it hard! So I need to focus on the new generations coming up behind me and let them enjoy what I once enjoyed! Share, I guess 🙂 Good luck Shelley. Admire your resolve and appreciate your enthusiasm for minimalist creativity. It just seems to be the only way to approach life is such a wonderful place. My own effort has taken a bit of a different turn. I have limited my ability to access my supplies. I have made a serious effort to stop myself every time I get the urge to make something new before I finish what I am doing. Finally, I have given myself a monthly goal of what I want to accomplish. I don’t always succeed, but it does help me stay focused and I’m seeing many more projects get finished. It does feel good. Sometimes it is difficult to part with accumulated treasures. I live in Austin, TX, and we have a place called Austin Creative Reuse. That’s where I take the items I no longer use. It is great to know that somebody else can use my stuff. Good luck, Shelley, with your final move. What a great resource, Gerhild! I would normally box up the goodies for the big Textile Center Garage Sale in the Twin Cities, but that was held just before we arrived back in Minnesota. But no worries, I have no doubt that others will put my excess supplies to good use! Thanks for your lovely note, Judith. This past year has, indeed, been quite the adventure. We moved a lot when I was young as well. I think all my “collecting” was a reaction to the years of being a gypsy. It’s work, but I’m looking forward to traveling lighter as we head South of Border later this summer. I just changed houses also. I can not believe all the sewing and crafting things I own! I wish I could purge but I too love it all. Your statement about less making more art could work for me because I can’t find anything! It is driving me crazy. Many, just maybe I will try to let go of something…….after all the thrift store has to have something to sell. It’s a dilemma, Barb. Keep all the fun stuff, or pare down to the essentials. Actually, there is a lot of space between those two points — and it’s perfectly okay to decide where you want to land. Maybe pare down enough that you can find stuff, but keep enough variety to keep your soul happy. The best part is that YOU get to choose! After a number of years of experimenting with different art and craft techniques, I have finally realized that my “Happy Place” is when I am doing hand sewing- embroidery, bead weaving, bead stitching. And, I realized that I was constantly feeling like I should be using all of the other supplies I had collected over the years. This resulted in constant guilt and frustration, and tended to stop me from doing anything creative. 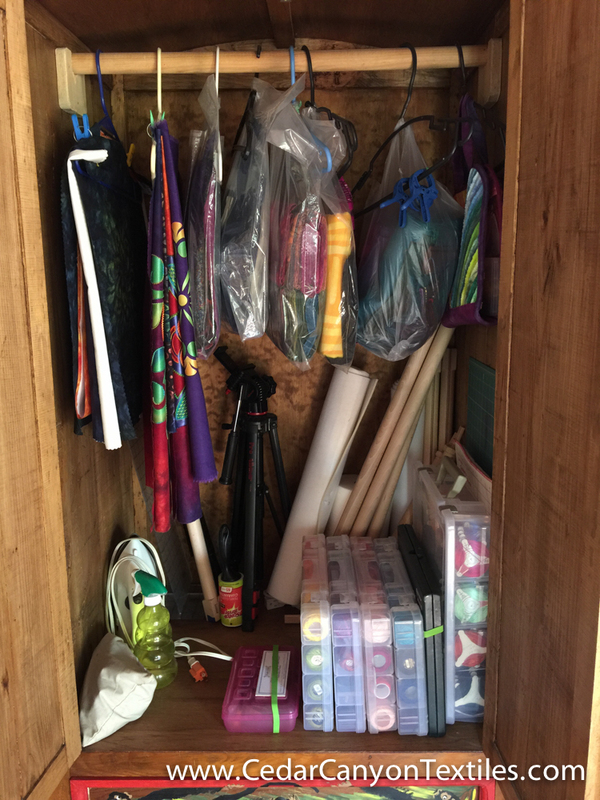 So, after the holidays, I finally decided to purge my craft room of these distractions. I packed things up by craft or technique and took it all over to our local art gallery. They were so thrilled to receive boxes of books and supplies! And, I felt good knowing that people who would appreciate these things would benefit from my donations. Now, I can focus more on what I really enjoy! Good for you, Patty! I’m so glad that you’ve found peace of mind at the end of the purging. I so understand and agree with your comment about all the stuff and options stomping on your creativity. I’m right there with you! I recently made a move from Arizona to Northern Colorado. I weeded some of the stuff before I, left but ran out of time and energy. When I started arranging the Fort Collins studio, I learned of a local thrift store called What the Scrap. They will take almost anything craft related and lots of stuff you wouldn’t even think of; there was a list on line. I found it was easy to part with the supplies that I had once bought for a class or project knowing that they could be reused by someone else. Yes, when I delivered the boxes, I was tempted to buy but resisted… that day anyway. I love the info about a craft-based thrift store — as long as I don’t go inside and start shopping!